Warren J. Samuels Each book in this series explores the present status of its field in terms of where it is, how it got there, the existing tensions within the field, and something of how the field might develop in the future. Each book presumes that work in each field is neither settled nor unequivocal. Each book attempts to comprehend its field as an evolving, developmental process or set or efforts. 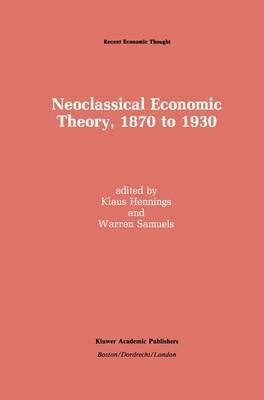 This particular book, covering neoclassical economics, is the third of three in the field of the History of Economic Thought. The others are Pre-Classical Economic Thought, edited by S. Todd Lowry, and Classical Political Economy, edited by William O. Thweatt. Each one conducts the same kind of analysis as the others in the series, with the understanding that here we are dealing with the history of interpretation, rather than a substantive body of analysis of a certain aspect of the economy: for example, labor or international trade. (That understanding must be com- plex and subtle, inasmuch as revision of interpretation of earlier ideas is part of the process-both cause and consequence-of re-analyzing the economy. ) In this group we are interested in how recent and contemporary writers have interpreted the history of economic thought differently, both among themselves and from earlier writers. 1 NEOCLASSICAL ECONOMIC lHEORY 2 Several topics must be discussed to place such work in perspective, in part as it is here applied to the history of the interpretation of neoclassical economics.